These little booties are crocheted and so very cute. You’ll find the same design in a knitted stay-on baby bootie pattern by Bernat. 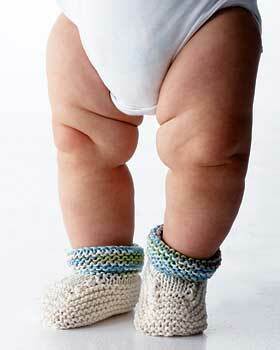 Download the stay-on crocheted baby bootie pattern here: Bernat_KW crocheted booties. Row 11: K12, K2tog, K1, K2tog, K12. Row 12: P11, P2tog, P1, P2tog, P11. Row 14: P9, P2tog, Purl 1, P2tog, P9. Row 15: K8, K2tog, K1, K2tog, K8. Row 16: P7, P2tog, P1, P2tog, P7. Rows 17 through 22: Knit. Bind off, leaving 10″ of yarn to sew up back seam. 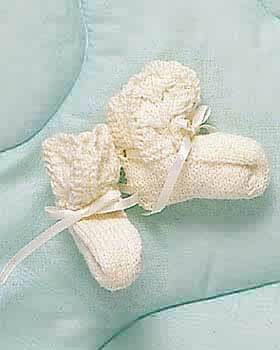 Sized to fit babies 0 – 3 months (3 inches in length). You can make them longer, you know. For questions, email me. So very sweet for a special celebration or on baby’s christening day. Baby Mocs, Booties knit Portuguese style and Summer “Lambie” crochet booties at knitnscribble.com. Quick baby gifts: baby hoodie sweater, knit sideways; perfect baby blanket pattern, quick and easy free patterns with pictures. These booties are of such high quality and craftsmanship! I can see them here, in finer stores, anywhere and get a notice. If I had a baby, I would have them for him. They are so unique and they do look as though they would ‘stay on’. Love it! I’ve been trying to find your pattern on line for the knit stay on baby booties, but haven’t been able to locate it. I’m hoping you can tell me where I can find it. I went on Knit_n_Scribble and couldn’t locate them. I think they are great. Could you please let me know where or how I can get the instructions for there booties. 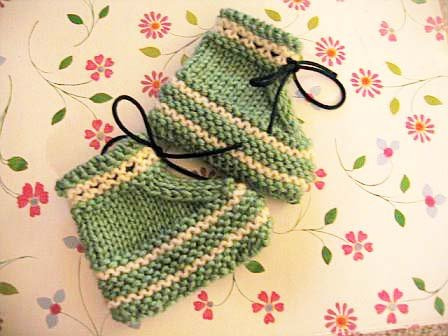 Pattern links for knit and crochet stay-on booties have been updated here. Sorry for the missing link. Thanks for reading. Enjoy the free patterns. 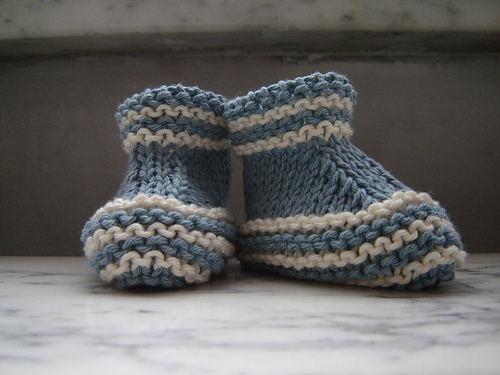 The little blue and white knitted booties are just another color choice of the Becky’s Booties pattern written out right above their photo. The Bernat booties in the first photo of the post are a pdf download, the link is there at the bottom of the photo (the one with the little chubby legs). Thank you for reading, I hope this answers your question. Let me know and will try again. So jealous you have a little one ready for ‘spunky’ socks! I made the booties (green with black ties). Twenty nine stitches is too tiny-doll size. I added ten stitches and it will nowfit a newborn. this is good to know, thanks for commenting. Would love to see your finished booties! Thanks for reading. Is there a way to get these in larger sizes? They look really nice! I would use same pattern, larger needle by one size and larger gauge yarn. Hello 🙂 There is a little blue and white pair of high top baby booties with a white stripe on them on this posting. I’ve looked all over for them, but I can’t find the pattern. It’s the bootie between the white christening pair and the little green and yellow pair. Can you tell me where I can find the pattern for them? SO cute!